You're ready to begin the For Sale By Owner process and have decided that holding an Open House is a good idea. Good for you! I’m preaching to the choir when I tell you that leaving walls of photos of your cute kiddos is a major “don’t” for an open house. I know you’ve seen just about every real estate professional on TV verbally tear home sellers apart for clutter--especially for personal clutter such as photos--when they’re trying to stage their house for a sale. If you’re considering an Open House as part of your home selling strategy, there are some other key don’ts for you to watch out for. 1. Don’t forget that people buy based on emotion! Ask any branding expert, and they’ll tell you that people buy products—for instance, your house!—based on emotions. The last thing you want prospective buyers associating your home with is the miserable, nauseating migraine that blindsided them when they stepped into your bleachy-clean bathroom. It’s great that your bathroom was squeaky clean, but you’ve now left your prospect with a negative emotional experience. MilitaryByOwner Staff Writer Monica Schaefer shares that what consumers smell can help determine how much they’ll spend and thus what they’ll offer for your house. To put your prospects in the best emotional frame of mind, she suggests using fresh, clean scents such as lavender and lemon rather than fussy scents such as potpourri, incense, or perfumed candles. Of course, you’ve got to have a fresh, clean house to go along with that smell; a spray of Febreze just won’t cut it here. Ditch the junk, clean it up, turn on all the lights, and open all the doors. 2. Don’t expect to sell that day. I love when TV home seller stories end on a happy note—with a sale, and preferably on Open House day. Who doesn’t love a happy ending? Keep in mind, though, that just because you’re hosting an Open House doesn’t mean that you’ll sell your home that day. Even if your real estate agent received an offer, it’s unlikely that the prospective buyer presented documentation proving that he or she is a qualified pre-approved buyer with the ability to acquire a mortgage to buy your home. 3. Don’t leave your valuables and personal items out. You have no idea who’s touring your property. Sure, they may be interested, eager, qualified buyers with pre-approved documentation in hand, but you need to be prepared for those who aren’t. Some see an Open House as an invitation to scope out a property for a large ticket item, while others may commit crimes of opportunity; they’ll swipe prescription drugs or jewelry if it’s left lying out. The National Association of Realtors reported 9% of all homes sold in 2013 had an Open House as part of their sales strategy, but that statistic is misleading. It doesn’t mean that the house sold as a result of it, but rather that it was part of a larger marketing strategy. An Open House provides your property with more exposure through street signs and advertising, so even though your actual buyers may not tour your home that particular day, they may instead see that an Open House is occurring and request a private tour from the real estate agent on a day that better fits their schedule. If you’re hosting an Open House, make sure to update your advertisement on MilitaryByOwner to add the words “Open House” and the date to the first few words in your comments. That will help make it easier for prospective buyers to find you. And make sure to use street pointer signs! 5. Don’t forget the front door! Make sure your home is both inviting and has good curb appeal. You can easily boost how welcome your door looks by adding a wreath, a potted plant, and a cheery door mat. A couple of balloons tied to your mailbox can help prospective buyers feel more comfortable with approaching your home; the balloons say that yes, this is an event, and you are welcome! If you’re expecting a military relocation this summer and need to begin thinking about your home sale, then you may want to begin considering the curb appeal of your house as a whole. You might want to show yourself the front door. 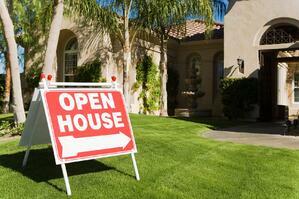 Having a seller present for an open house might make prospective buyers uncomfortable. They want to explore, test windows, peek in closets, and ask questions; they don’t want to do that with a homeowner hovering. You might choose to use an agent or a trusted friend to host for you. 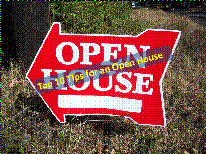 Need more tips for your Open House? Click below!